Industry benchmarks are an important tool for hotels to compare their performance to their competitors’ and to identify improvements that will have the most impact. With 23,000 hotel customers in 160 countries, Revinate has amassed a lot of data about online reviews. Using Revinate’s solution for Online Reputation Management, hotels and management companies are able to read, analyze and act on their reviews, as well as track performance against their competitors. Revinate performed a deep dive into its online review data and analyzed more than 20 million reviews from 80,000 properties in 125 countries. 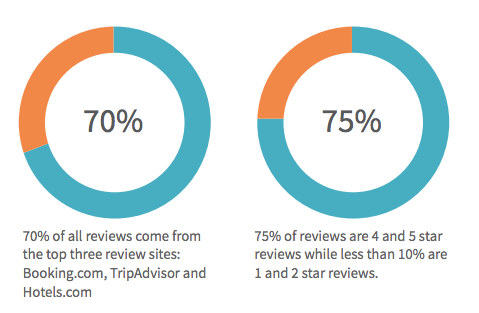 These reviews were published on more than 100 online review sites and OTAs between January 1, 2014 and December 31, 2014. 1. Reviews come in from more than 100 different sites, but most are concentrated on a few of the major sites. It is important for a hotel to understand its own mix of review sources. 2. Contrary to popular belief about reviews being a source fro complaining customers, the positive reviews vastly outweigh the negative. The key for hoteliers is to amplify the positive ones and resolve the negative ones. Benchmarking allows hotels to track their performance against the competition and to set realistic and specific goals based on industry standards. A 2014 Revinate study found that Revinate customers that set goals outperform those that didn’t in terms of having the highest average rating and the largest percentage of five-star reviews. Reviews are a very important benchmark, according to a Cornell University study that found that a larger number of positive reviews is correlated with increased bookings and the ability to raise rates. Our 2014 Hotel Reputation Benchmark Report is designed to provide benchmarking guidelines for hoteliers, so they can assess and improve their own performances. CLICK HERE to download the full report. Thanks for your note! There are a couple of ways to get information from us. You can subscribe to this blog to get weekly emails that contain updates with regard to industry trends, best practices, and thought leadership. If you’d like to get involved on a deeper level, you can email us at info(at)revinate(dot)com to schedule a demo. We’ll show you how to collect your online data to get some pretty cool analytics on your guest satisfaction performance. Additionally, we have several customers in the Sydney area, including the Amora Jamison Hotel Syndey. As you’re first starting out, it’s not a bad idea to sign up with us to keep track of your competitive set. Feel free to email me directly at carrie(at)revinate(dot)com if you want to discuss further. I’m happy to help!